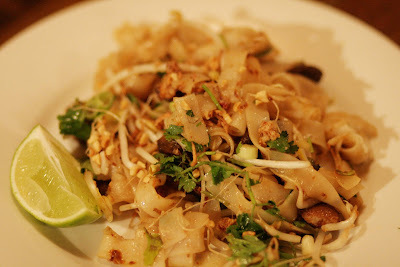 Tonight I cooked Pad Thai with Pork. It was delicious even if I do say so myself. J, Kady, Leah and Nick loved it as well. This recipe will feed about 8 to 10 people easily. 1. Cut pork into thin strips. Put a saucepan of water and bring to the boil. 2. Combine cornflour and soy sauce together and mix through the pork. 3. Combine tamarind paste, brown sugar, fish sauce in a bowl. This is your Pad Thai sauce. 4. Chop up garlic, chilli and ginger in a bowl. 5. Chop coriander, basil and spring onions in a bowl. 6. Heat up your wok or electric frypan (high heat) and add olive oil and sesame oil. Add the garlic, chilli and ginger and cook for a minute. Add the marinated pork and cook. 7. Add your noodles to the boiling water and cook according to instructions. Take care not to over cook. 8. Drain your noodles and add them into your wok. Add the Pad Thai Sauce and mix through the noodles and pork. 9. Add the bean shoots, coriander, basil and spring onions. 10. Serve garnished with crushed peanuts, fried shallots and a wedge of lime. I love the texture and colour of this dish. Enjoy.